As leaders and would-be leaders, wildlife is replete with valuable lessons if we take the time to observe and ponder. Here’s a story of how the mother Giraffe teaches the Baby Giraffe the art of survival in the face of predators. Baby giraffes learn a very important lesson early in life. The birth of a baby giraffe is quite an earth-shaking event. A baby giraffe falls 10 feet from its mother’s womb and usually lands on its back. Within seconds it rolls over and tucks its legs under its body. From this position it considers the world for the first time and shakes off the last vestiges of the birthing fluid from its eyes and ears. The baby giraffe shrivels up and lies still, too weak to move. The mother giraffe lovingly lowers her neck to kiss the baby giraffe. And then something incredible happens. The mother giraffe lifts her long leg and kicks the baby giraffe, sending it flying up in the air and tumbling down on the ground. The kick rudely introduces the newborn giraffe to the reality of life. As the baby lies curled up, the mother giraffe lowers her head long enough to take a quick look. The mother giraffe position herself directly over her calf. She waits for about a minute, and then swings her long, pendulous leg outward and kicks her baby again, so that it is sent sprawling head over heels. When it doesn’t get up, the violent process is repeated over and over again. Finally, the calf stands for the first time on its wobbly legs. 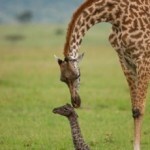 Glad to see the baby standing on its own feet, the mother giraffe comes over and does the most amazing thing. She kicks it off its feet again. The baby giraffe falls one more time, but now quickly recovers and stands up. The mother giraffe is delighted. She knows that her baby has learnt an important life and survival lesson. Why does the mother giraffe do this? She wants it to remember how to get up. In the wild; lions, leopards, hyenas, leopards, and wild hunting dogs enjoy young giraffe meat. Unless the baby giraffe quickly learns to stand on its feet, run and stay with the herd – it will have no chance of survival. Like life, leadership is a journey which requires years and years of learning, practice, training, hard work and commitment to become an effective leader. It is a journey filled with several knock downs, challenges and obstacles, turns and twists; victories and defeats; successes and failures. As it is said, “A smooth sea never made a skillful sailor.” The hallmark of leadership is not in groaning or complaining because you have been knocked down. What sets a leader apart from the rest of the pack is not staying down but in getting back up. Nelson Mandela once said, “The greatest glory in living lies not in never falling, but in rising every time we fall.” As you grow and progress in your leadership journey, expect to be knocked down, learn lessons while you are down, and then get back up and get on with it. Have A Pleasant Week! MOTIVATIONAL MONDAY WITH DAN: Are You Guarding a Concrete Slab? Welcome to a brand-new week. Great opportunities for growth, success and progress awaits. Be expectant…. MOTIVATIONAL MONDAY WITH DAN: Take Ownership! Take Responsibility! MOTIVATIONAL MONDAY WITH DAN: Set Your Goals! Set Your Sails!